IF YOU SUSPECT YOUR COMPUTER IS BEING MONITORED BY YOUR ABUSER, PLEASE USE THIS WEBSITE CAREFULLY. Visiting a website about domestic violence may alert your abuser that you are looking for help, and this could potentially put your safety at risk. Below, we have provided some helpful information about technology and internet safety. Your “web browser history” leaves behind a trail of information. Did you know that by looking at the “browser history” of a computer it is possible to tell what websites have recently been visited? Sometimes, a computer will store this information for several months or more. If you are in an abusive relationship, your abuser may be monitoring what websites you have been looking at. Visiting a domestic violence agency’s website may alert your abuser that you are looking for help, and this may increase violence or put your safety at risk. Below we have provided step-by-step instructions on how to clear your browser history in both Internet Explorer and Moxilla Firefox. This will help keep your internet browsing private**. You can clear from your browser history all websites you visited in the last hour, two hours, four hours, day, or ever. PLEASE ALSO BE AWARE that if your abuser IS monitoring your website use, suddenly clearing all the history may be a ‘red flag’. When in doubt, find a safe computer or call us for help. We can be reached at our toll-free, 24-hour hotline at 1-866-401-2425. 2. After you have selected “tools”, select “delete browsing history”. When that new window opens, select all boxes that apply and hit the “delete” button at the bottom. Tip: Selecting “history”, “download history”, and “form data” are important, because these options will clear your searches, any records kept by the computer of downloads made, and also browser history/websites visited. 1. Open Internet Explorer, and hold down the buttons CONTROL (ctrl), SHIFT, and DELETE at the same time. 2. A window labeled “delete browsing history” will open. Select all boxes that apply and hit the “delete” button at the bottom. Tip: Selecting “history”, “download history”, and “form data” are important, because these options will clear your searches, any records kept by the computer of downloads made, and also browser history/websites visited. 1. Open Mozilla Firefox. If your menu bar is enabled, you will see a “history” option at the top of the screen. If not, click on the orange “Firefox” tab in the upper left corner of the screen and then select “history” in the dropdown menu. 2. Next, select “clear recent history”. 3. In the new menu that opens, make sure all boxes are checked. You will also see options for “time range to clear”. You can select “everything” if you want to clear ALL browser history. HOWEVER, if you think this may create a red flag for your abuser, you can select one of the following options: ‘last hour’, ‘last two hours’, ‘last 4 hours’, or ‘today’ to delete the browser history for the selected time period only. Make sure that whichever option you chose will remove all of the browsing history that you do not want visible. 4. When you have decided which time range you want to clear, hit the CLEAR NOW button. 1. With the Mozilla browser open, press CONTROL (ctrl), SHIFT, and DELETE at the same time. A menu will pop up. 2. In the new menu that opens, make sure all boxes are checked. You will also see an option “time range to clear”. You can select “everything” if you want to clear ALL browser history. HOWEVER, if you think this may create a red flag for your abuser, you can select one of the following options: ‘last hour’, ‘last two hours’, ‘last 4 hours’, or ‘today’ to delete the browser history for the selected time period only. Make sure that whichever option you chose will remove all of the browsing history that you do not want visible. 3. When you have decided which time range you want to clear, hit the CLEAR NOW button. Whether you live with or apart from your abuser, CHANGE YOUR PASSWORDS. The easiest way for an abuser to collect information about you is by simply logging in to your accounts! If you think about it, abusers can use knowledge of your passwords to financially, socially, and professionally harass and sabotage you. Here are some important password safety tips! 1. Change your password often. 2. Do NOT write your passwords down somewhere where your abuser can find them! (Concerned about remembering them? Download KeePass! It is an encrypted program [that means it’s very secure, and can’t be picked up by key loggers!] with a master password that stores all your account usernames and passwords. It’s FREE, and you can download it HERE. Just make sure your master password is NOT guessable! 3. Passwords should contain letters AND numbers AND punctuation. Make it complicated! 4. NEVER use familiar things as your password. Birth dates, favorite colors, names of pets- JUST SAY NO! Did you know that in 2012, the two most commonly used passwords were a list of sequential numbers? “123456” and “12345678”. Not very creative. You can do better! 5. Make all of your passwords different. Think about it. If all of your passwords are the same, then access to one account means access to all accounts. 6. Beware security questions! If all your abuser needs to know to reset your online banking password is your “mother’s maiden name”, you might have a problem. Choose unusual questions and pick an answer to them that nobody would know. Better yet—writing your own security question is sometimes an option! Let’s face it. It’s the 21st century, and “just get off Facebook” is NOT an option when it comes to maintaining privacy from an abuser. Facebook, Twitter, LinkedIn, MySpace, and Google + are just a few of many commonly used social networking sites. Aside from being fun, social networking provides us with an ‘online support group’ of sorts and helps us connect with friends, family, and resources. Being cut off from these social networking sites may very well do more harm than good. Unfortunately, when an abuser misuses social networking for harassment, stalking, or surveillance, the “solution” often involves the victim being told to stay away from the internet. Talk about punishing the wrong person! If an abuser is misusing Facebook, Twitter, or another social networking site as a tool to harass or monitor, simply deleting the account may not fix the problem. What it WILL do is force the abuser to change his tactics, and the survivor will ultimately be punished. So what is the solution? THE GOOD NEWS is that most social networking sites have adjustable privacy settings that can help you maintain your privacy from unwanted persons. 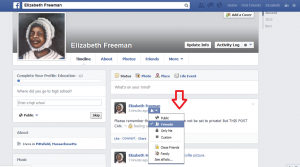 On Facebook, for example, the privacy of each post is customizable. You can select your audience for each post as “friends”, “public”, or “restricted profile” which will allow only designated people to see it. Photos also have individual settings. You can select your audience for each photo that you post, including your profile pictures. 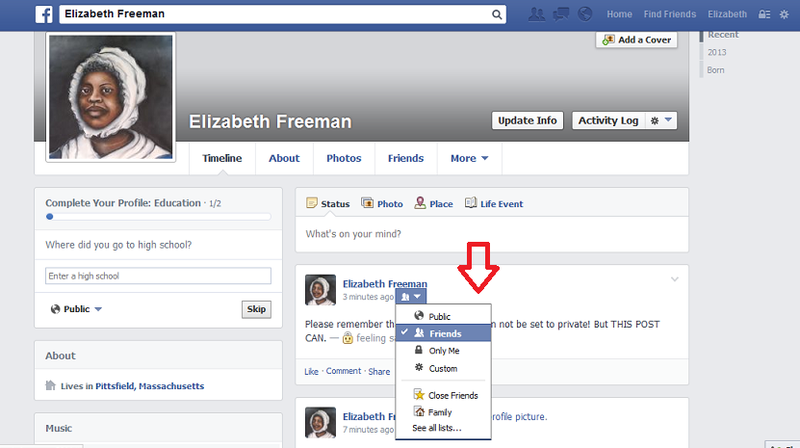 Remember that cover photos are ALWAYS set to “public”, and the privacy settings for these images cannot be changed. Consider uploading a generic, non-identifying image as your cover photo such as a wildlife or nature photo. General privacy settings for Facebook can be set by clicking in the upper right corner of the screen on the symbol that looks like a padlock. This will take you to ‘privacy shortcuts’. From here you can see answers to commonly asked security questions, or you can select “see more settings” at the bottom of the menu to visit the full ‘Settings and Tools’ page. From there, you can edit your general privacy settings, including whether or not your content is searchable on the internet, who can look you up, and more. When in doubt, chose the most secure setting. If you need more help with these settings, call us, or check out the all-inclusive FACEBOOK SAFETY GUIDE. A great way to check the privacy of your site, is to use the “view as” tool, seen below. First, you will want to make sure you are looking at your own timeline (and not at your news feed). You get there by clicking on your name in the upper right corner of the screen in the blue menu strip. Once you see the timeline view of your own profile (and NOT your general news feed) you can select the “view as” option, as seen below. After you have selected “view as”, you can choose to see how your profile looks to the public, OR…. ….you can type in the name of a specific person, and you will be able to see what your profile looks like to them specifically! If anything shows up as “public” that you don’t want visible, you can change the setting of that post to “friends” or “restricted”. If you need any help figuring out whether or not your information is private, ask friends or family for help or give us a call! We can help you come up with a safety plan that includes internet and social network usage. And lastly (but very importantly!) ALWAYS be sure to always log out when you are finished using a social networking site. Click here for the full Facebook Safety Guide! ABSOLUTELY NOT. If your abuser knows information that he/she/they shouldn’t, there is a good possibility that they are using technology to monitor you. Don’t panic! Information spreads quickly and easily these days, so there may also be another explanation. Change passwords, and check to make sure your social networking sites are set to “private”. When the internet browser asks “do you want to remember this password?” always select “NO”, and be sure to log out of email and Facebook accounts when you are finished. You can ask friends or family if anybody has shared personal information about you that may have gotten back to your abuser. What’s most important in dealing with this scenario is that you trust your instincts. Does your abuser know about a conversation you had in confidence while nobody was home? There are various ways that abusers can use technology to monitor you, and they MAY be doing so. Please do not try to remedy this scenario alone! Changing your behavior may alert your abuser that you have stumbled upon their secret, so proceed with caution. If you suspect that your actions and conversations are being monitored, CALL US FOR HELP.